I understand that the new contributor indicator is shown on my posts on sites where my first post is not very old. However, in many cases, for various reasons, I don't want my post to be identified as having come from a "new contributor". Is there a way I can remove this indicator from my post, or make it not show up on my post in the first place? If not, can that please be added? This is something that we haven't considered. We will probably let the current implementation run for a bit and evaluate the results. Then, we can consider enhancements that make sense. Even if we do not get to option to remove it from all our posts - can we either have the meta's use the same calculation as the main sites they are from or include an option to turn it off on just the meta sites? 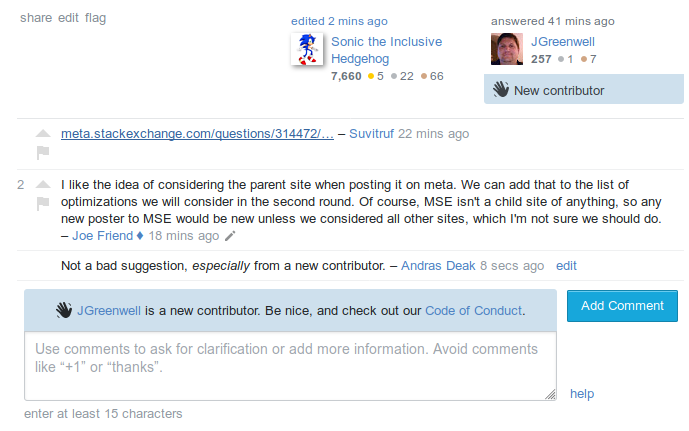 As, when you have users on meta with years on the site and many contributions which just don't include the SE network site's meta - it seems like a bug when they show up as a "new contributor". And I have recently seen an 18k user show as a "new contributor" due to their first meta post. Not the answer you're looking for? Browse other questions tagged feature-request status-review new-contributor-indicator . What are the exact criteria for the “new contributor” indicator to be shown?